Wouter Beukema (2013): Saurodactylus mauritanicus (Duméril & Bibron, 1836). Au: Martínez, G., León, R., Jiménez-Robles, O., González De la Vega, J. P., Gabari, V., Rebollo, B., Sánchez-Tójar, A., Fernández-Cardenete, J. R., Gállego, J. (Eds.). Moroccoherps. Amphibiens et reptiles du Maroc et au Sahara occidental. Disponible à www.moroccoherps.com/fr/ficha/Saurodactylus_mauritanicus/. Version 9/06/2013. Consulté le 25 Apr 2019. Español: Geco magrebí, geco de Alborán. Aire de répartition de Saurodactylus mauritanicus d'après l'UICN. As part of their monographic work, Dumeríl & Bibron (1836) described Gymnodactylus mauritanicus based on specimens originating from Algiers, Algeria. Only a few years later Fitzinger (1843) transferred this species to the genus Saurodactylus, of which it has been part ever since. Bons & Pasteur (1957) attributed the name S. m. brosseti to the allopatric populations occurring in south-western Morocco, which are now recognized at species level as S. brosseti (Bons & Geniez, 1996). Genetic variation within S. mauritanicus is minimal according to mtDNA and nuclear analyses (Rato & Harris, 2008), which is likely a result of the largely continuous distribution and wide environmental tolerances of this species. Saurodactylus mauritanicus is a minute gecko which measures up to 60 mm total length, which makes it the smallest species in the genus (Bons & Pasteur, 1957). Dorsal scale rows range from 70-90. Scales are relatively granular. Snout vent length is slightly smaller than tail length. Tail tapers to a fine point. Subcaudal scales of the non-regenerated tail are large and transversely rectangular shaped, while those of regenerated tails are even slightly larger and irregular-shaped. Between 14-20 lamellae are present under the 4th toe. Saurodactylus mauritanicus. Ras Kebdana. Photo: © Wouter Beukema. Dorsal colouration varies from greyish to brown or bronze, interspersed by vague dark brown or black patches. This pattern can be highly restricted, with individuals being nearly uniform coloured. Cream to yellow coloured ocelli are often present on the entire body, which are especially conspicuous in juveniles. The tail is either yellowish (older individuals), yellow or bright orange (younger individuals) with a similar pattern as the dorsum, although the ocelli are usually much larger. Additionally, larger dark stripes can be present on the tail. The lower flanks and underside are lighter coloured than the dorsum. All members of the genus Saurodactylus are highly cryptic species which spend considerable amounts of time hidden under large stones. Juveniles are readily encountered, in contrast to adult individuals. Their behaviour is largely crepuscular, with general activity taking place during sundown (Bons& Geniez, 1996). Coastal populations remain active year-round as long as temperatures are favourable, while inland populations generally spend several months in hibernation (Pers. obs.). Females can lay up to eight clutches of a single egg per year in captivity, which are deposited in self-dug tunnels (Joger et al., 2009). The diet of Saurodactylus species has reported to consist mainly of beetles (Bons & Pasteur, 1957). Saurodactylus mauritanicus occurs in north-eastern Morocco, north and north-western Algeria and Spain; Melilla and the Chafarinas Islands (Bons & Geniez, 1996). In Alborán Island, where it was found in 1997, it has never been found again despite the many prospections done in the island so it could have been an involuntary introduction which was unsuccessful (Paracuellos et al., 2005; M. Paracuellos, pers. comm.). Within Morocco, this species occurs from the northern foothills of the Rif Mountains (where the exact western distribution limit is not known), eastwards through the arid eastern Rif. The southern limit is formed by the Middle Atlas (Barata et al., 2011) and the Haut Plateaux. 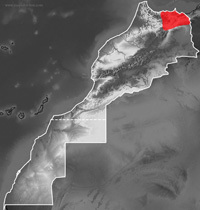 Populations occur from sea level up to 1200 m in the eastern Rif Mountains and BeniSnassen Massif. Habitat. Ain Sfa. Photo: © Wouter Beukema. 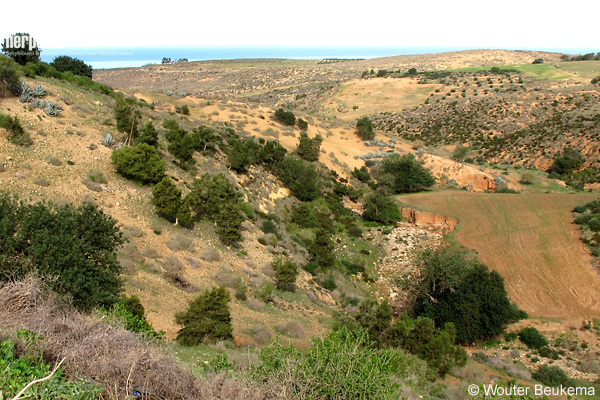 Habitat near Ras Kebdana. Photo: © Wouter Beukema. 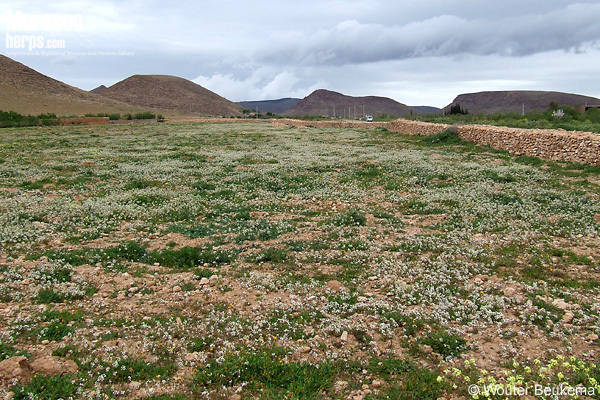 Habitats which S. mauritanicus occupies are generally semi-arid to arid, while being characterized by sparse vegetation and an abundance of stones (Fahd & Pleguezuelos, 1996). Individuals have also been found in dune ecosystems and open coniferous- or Eucalyptus forests. Where it is found, this species is often moderately to highly abundant (Werner, 1931). The continuous distribution and general abundance of S. mauritanicus motivated Joger et al. (2009) to list this species as ‘Least Concern’ on the IUCN Red List. Barata, M., Perera, A., Harris, D.J., van der Meijden, A., Carranza, S., Ceacero, F., García-Muñoz, E., Gonçalves, D., Henriques, S., Jorge, F., Marshall, J.C., Pedrajas, L. & Sousa, P. 2011. 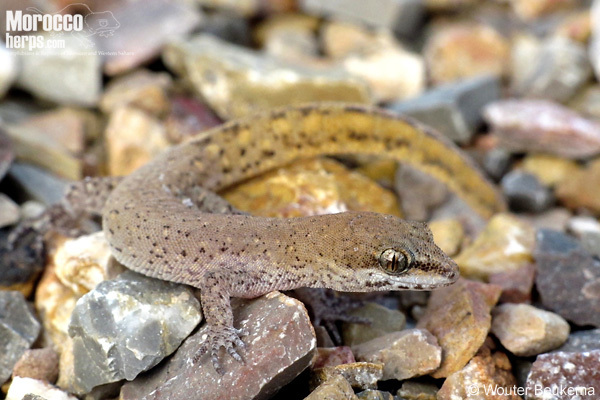 New observations of amphibians and reptiles in Morocco, with a special emphasis on the eastern region.Herpetological Bulletin 116: 4-14. Bons, J. & Pasteur, G. 1957. Nouvelles remarques sur les saurodactyles, avec description de Saurodactylus mauritanicus brosseti n. subsp. Bulletin de la Société des Sciences Naturelles et Physiques du Maroc 37: 175-195. Duméril, A.M. & Bibron, G. 1836. Erpetologie Générale ou Histoire Naturelle Complete des Reptiles, Vol. 3. Encyclopédique Roret, Paris. 528 pp. Fahd, S. & Pleguezuelos, J.M. 1996. Los reptiles del Rif (norte de Marruecos), I: Quelonios, Saurios. Revista Española de Herpetología 10: 55-89. Fitzinger, L. 1843. Systema Reptilium, fasciculus primus, Amblyglossae. Braumüller & Seidel, Wien.106 pp. Joger, U., Slimani, T., El Mouden, E.H., Geniez, P. & Martínez-Solano, I. 2009. Saurodactylus mauritanicus. In: IUCN 2012. IUCN Red List of Threatened Species. Version 2012.2. . Downloaded on 28 December 2012. Paracuellos, M., Gonzáles-Miras, E., Rodríguez, A., Alesina, J.J. & Nevado, J.C. 2005. 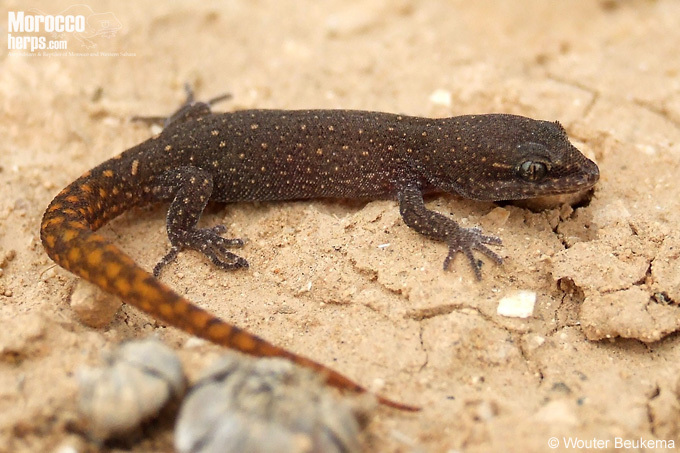 Sobre la presencia de gecónidos (Squamata: Gekkota: Gekkonidae) en la Isla de Alborán (Mediterráneo Occidental). Zoologica Baetica 16: 141-146. Rato, C. & Harris, D.J. 2008. Genetic variation within Saurodactylus and its phylogenetic relationships within the Gekkonoidea estimated from mitochondrial and nuclear DNA sequences. Amphibia-Reptilia 29: 25-34. Werner, F. 1931. Ergebnisse einer zoologischen Forschungsreise nach Marokko. III. Unternommen 1930 mit Unterstützung der Akademie der Wissenschaften in Wien von Franz Werner und Richard Ebner. III. Amphibien und Reptilien. Sitzungsberichte der Kaiserlichen Akademie der Wissenschaften in Wien 140: 272-318.